As a small business owner, I understand the struggle of work-life balance and the constant feeling that there are not enough hours in the day. Balancing the needs of your employer or clients with your actual job requirements, not to mention your friends, family, and personal well-being, can be overwhelming. Sometimes it seems impossible. I’m here to tell you that the demands of your job won’t get easier. You may think you see a light at the end of the tunnel – a big deliverable that will be off your plate or a client who’s moving on at the end of the month – but those responsibilities will soon be replaced by new ones. You may feel like you’re working around the clock now to pay your dues, but climbing the corporate ladder or growing your business will only bring on new demands. With success comes more work. So how do you ever have a life? 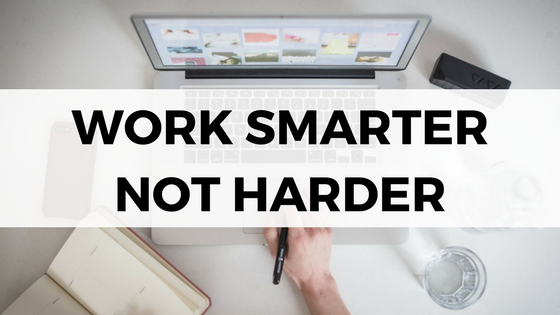 By working smarter, not harder. But today isn’t just about increasing productivity, it’s about working smarter. There are many aspects of your workload that are beyond your control – fire drills, client whims, forces of nature – but how you face those challenges can dramatically affect your workload. Be proactive, not reactive. Too often, it’s the squeaky wheels that get the oil. Your client, boss, or team member will dump something on your desk that needs to be done immediately or ask you to do them a favor and help them with a project or task. And of course, you have to oblige. But what if you anticipated their needs ahead of time, offered to help, and worked it into your schedule so you weren’t hit with surprises? We have a client who travels a lot; I’m talking 6-7 months out of the year. Between the many flights, speeches, meetings, and media interviews, there is a lot on his calendar. Something is bound to go wrong, and when it does, he calls us. I used to get so frazzled, trying to deal with the delayed flights or lost directions or missing A/V equipment in real time, but now, I’ve become proactive in my approach. I set an alarm to confirm everything 2 weeks ahead, then spend 20-30 minutes on a call with the client reviewing his calendar and addressing any questions. I don’t book him for flights with tight connections and I make sure to fill his itinerary with detailed notes and contact information, so any questions he has can be answered by looking at his calendar. If you notice a number of fire drills and last minute needs coming from one person or department, take the time to address potential issues in the future. Play out scenarios and identify areas where you can be of assistance before there’s an emergency or make a list of possible ways you may be roped into the project. It takes half the number of hours to address something ahead of time than it does to react to it in the moment. Implement systems. I recently read THE POWER OF HABIT*, and the book chronicles the importance of habits and how our bodies have the potential to go on autopilot. Whether it’s a dementia patient knowing how to make breakfast or Michael Phelps not being affected when his goggles filled up with water and he couldn’t see a thing, habits eliminate the guess work and reduce the number of decisions we’re required to make. Chances are, there are dozens of different tasks on your plate every day. You’re juggling multiple projects, different teams, maybe even multiple jobs. You’re constantly being faced with decisions and trying to keep track of everything coming your way. This is where systems come in. Whether it’s a file system for your email, a project management system for team collaboration, or a system to automate your social media, these programs and workflows cut down on time while ensuring nothing slips through the cracks. When I take on a new client, I automatically plug all the tasks into Asana so I don’t have to keep referring back to their proposal and make sure I’m not missing anything. When I’m finished with this blog post, I’ll drop it in our Airtable* so that our VA can create images and schedule it for the week. It’s a habit and it’s automatic, meaning I spend less time making decisions and fewer balls get dropped in the process. Eliminate downtime. Between each meeting or task, most people take a few minutes deciding what they’re going to work on next. Depending on the work day and number of meetings, that could add up to almost an hour of downtime each day. That hour could instead be spent with your family, working out, or getting a jump on a future project. By taking the guesswork out of “what comes next?” you can save valuable minutes and get more work done in less time. Every morning, I plan out my day in my Panda Planner*. I fill out my meeting schedule, small tasks, and big projects. And then I work the planner. At the top of today’s list was “Write and schedule blog post.” As soon as I’m finished with that, I’ll take a swig of coffee and start on the next project. There is zero guessing and zero downtime. I even schedule times to check my email so that I don’t get derailed. By now, I can work like this from memory; I know which tasks I can squeeze in between meetings and which need more concentrated time. But if you’re just starting out with this practice, writing it down using a Panda Planner, Bullet Journal, or even just a whiteboard will help you eliminate the guesswork and be more efficient. I’m confident that if you implement these three practices now, you’ll have more hours in your day within the month. You’ll feel less overwhelmed, have more time to breathe, think, and grow, and have the bandwidth to expand your business. It’s not about working harder, it’s about working smarter. 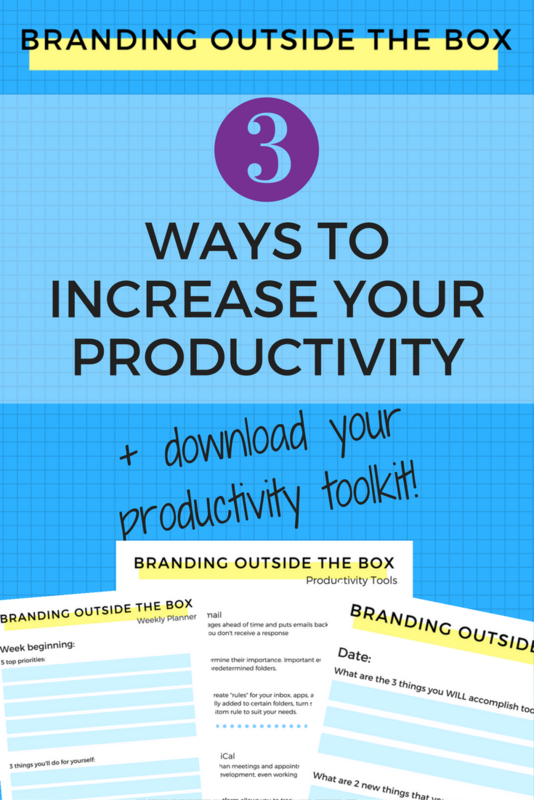 Don’t forget to download your Productivity Toolkit and share your favorite productivity tips and tricks in the comments! *Denotes affiliate links. I receive a small commission when you purchase products through these links and I only link to products or services that I’ve used and can honestly recommend. Reputation is everything, and I have no plans to risk mine for a few bucks.